I really love the ombre trend that's flying around the fashion and blog world these days! I thought I'd try my hand at a quilled, ombre snowflake. And since there was a request for some basic quilling tips, I thought I'd throw those in too. * Quilling takes a bit of practice, and a lot of patience, but in the end is not nearly as complicated as it looks. Your basic needs are a quilling tool (a pen-shaped dealy with a slotted end), a pin (for applying delicate dots of glue), glue (I like Aileen's fast-drying glue for all my paper crafts. I've also been known to use Mod Podge...basically you want a any glue that dries quick and clear), and of course quilling paper. This is quilling paper. It can be purchased in a variety of colors at most craft stores for $3-$5. Most the time it comes an 1/8" wide. You can cut your own, but it's a lot of brain damage to cut 1/8" strips whilst making sure that the edges are straight! Hold the quilling tool like so, and slip one end of the paper through the slot. Twist the paper while keeping a reasonable amount of tension until you have a tightly-wrapped coil on your tool. While holding the coil tightly, slip it off the tool. but not so tight that it bends. Release the coil so that it relaxes into a spiral shape. as you figure out how tight or loose you want your shape to end up. Pick your spiral up, and using your pin, dab a little bit of glue on the end. You only want enough glue to get it to stick. If you use too much, you'll have a gluey mess. Pinch the coil/spiral into the shape you want. In this picture, I pinched only one end to make a "raindrop." Here's what I meant about how loose or tight your shape will end up. These two raindrops were made using the same length of paper, however, I let one relax into a larger coil, so the over all shape turned out larger and looser. Build from the inside out. play around with them so that they're arranged just how you want them. There's no taking them apart once they're glued. Ahh, the subtle color change. It looks so fresh and wintery! *This is far from a comprehensive quilling tutorial. I hesitate to call it a tutorial at all, but at least you get the idea of how quilling works. If you're interested in a more complete tutorial, you can find a lot of them by doing a google search for "quilling." Absolutely beautiful!! You have far more patience than I do. Would love for you to share this at Sunday's Best! 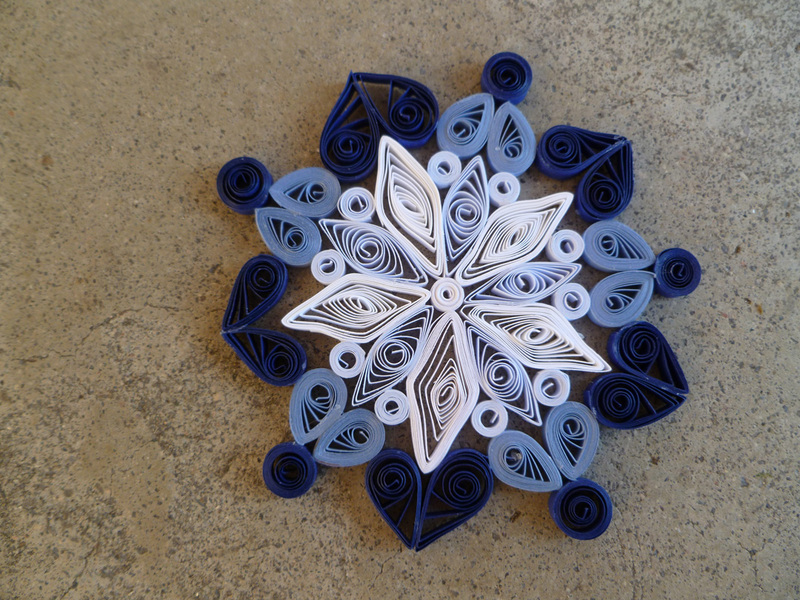 I just love quilling and your snowfake is lovely! I'm inspired to pull out my papers and quilling tool and get to work! oh my gosh, that is absolutely amazing! using snowflakes as my holiday decor is my favorite thing, as it speaks to the season and not just one holiday. gorgeous! The patience this must have taken. I bow down to you! Wow--your snowflakes are really beautiful! Have you considered selling these on Etsy? So pretty! I admire your patience, seems like that would take awhile!! WOW! This is Ahhh-Amazing! I have to say the most creative Christmas decor I have seen so far! awesome great! PLEASE come link up today over at Passionatelyperfect.com! Your newest fan!! Just beautiful - I really love how your snowflake turned out, and you make quilling seem super simple! Amazing work; thanks so much for the inspiration! Ombre and quilling. Two gorgeous things in one inspired project. Thank-you so much for joining our Pin'Inspiration party. Would love for you to hop over and grab a button. wow very pretty! i've gotten away from quilling for a while now but i think you've inspired me to start again! love it very cute! wow - this is amazing! What a gorgeous idea and eve better execution. This is perfect for snowflakes - I could see a whole tree full of these! to make one myself but a friend made a pretty plaque with some for me. Quilling is awesome! Those are quorgeous! Amazing! I am inspired to try this! PINNED. wow, it's absolutely gorgeous. You did an awesome job. Gorgeous! I would love for you to stop by and link up your ornaments to my 25 Days of Christmas Ornaments linky party. This is really gorgeous! I love paper crafting but one thing I have never tried is quilling, it always looks so fantastic that I am a little nervous to try it!! Wow that is amazing. I really love it! Hey there, thanks again for sharing last week at Pin'Inspiration Thursday. You are one of our features! Would love for you to drop by and grab a button.